We are proud to provide you and your family with our FREE pharmacy discount card. The cards are available at all of our locations and distributed during our various community events. The pharmacy discount card may be used at over 60,000 pharmacies nationwide (including most major chains) and can save you 14% to 21% on brand medications, and up to 75% on generics. There are no claim forms, no paperwork to file—just pick up a card and present it next time you’re purchasing prescriptions. This is not insurance nor does the discount card have any cash value. Everyone is eligible for this program and there are no age or income restrictions, and the best part—it’s absolutely FREE! So far this year, our patients have saved $9,887 (as of 10/30/13) with an average savings of 60.35%. 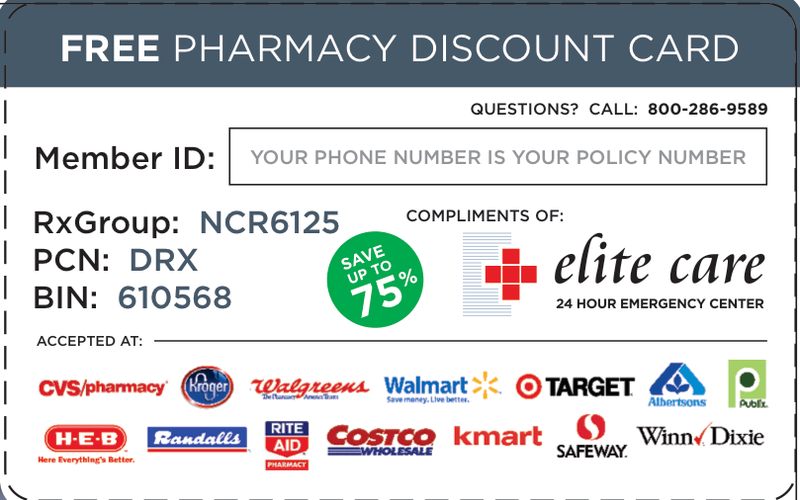 Pick the pharmacy discount card up for free at any Elite Care Emergency Center.